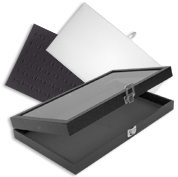 Find the perfect economy velvet jewelry trays & inserts for your store! Our collection features affordable & practical pieces, from stackable & utility trays to foam inserts for every type of jewelry piece: showcase everything from rings & earrings to chains & bracelets. Get the best deals thanks to our discount wholesale prices!